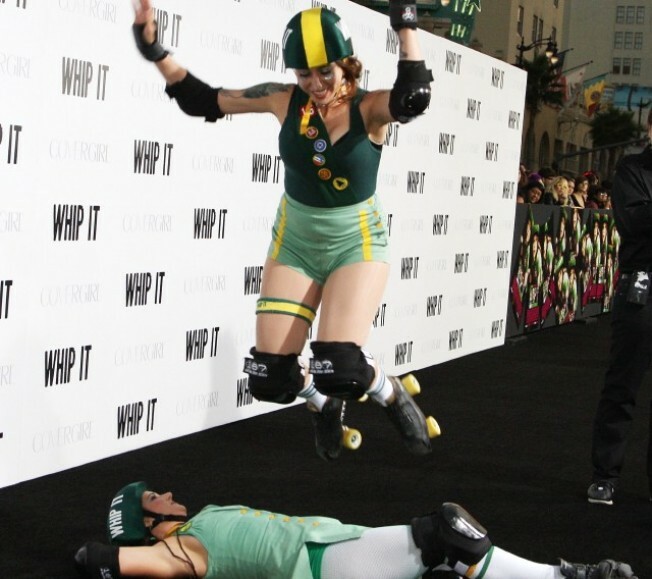 Derby skaters take flight at the September 29th "Whip It" premiere. The red carpet. The standard pose. The come-hither look. The over-the-shoulder glance. Oh, and here it is: the random kiss blowing. We're not bagging on any of it. It's not like we've ever walked a red carpet before. Oh wait, we have, but we strangely did not make the covers of the tabloids the following week. Must speak to manager. Hold on. First, must hire manager, then, must speak to manager. But we like to see the standard pre-premiere strutting get a fresh makeover, as it did on September 29th at the "Whip It" premiere. The red carpet was black. The director was the biggest star of the night (one Drew Barrymore, of course). And the derby girls? Out and about in full mini-skirted, fishnetted force. There was some fierce photo taking in front of the Chinese Theatre, and skaters leaping over each other on the carpet. We'll also give a nod to the afterparty centerpieces, which included full-size skates. Could people take them home? And are there any left in size 9.5? Well, we're old-school; we still like to rent our wheels. But we're new-school when it comes to new tricks at premieres. Hollywood honchos, take note: We, the enjoyers of magazines and web sites, would not mind more surprises. Get the Derby Dolls skating at every premiere, or hire the monsters that showed up at the "Zombieland" premiere. We're not opposed to posing. But posing, with zombies, is a fabulous thing.